The first one bombed, so I guess it really was crimson and clover, over and over! 🙂 Another business card-sized watercolor in (you guessed it) alizarin crimson. Happy Sunday! I hope it’s gorgeous where you are, too. I’m really swept away by spring this year, looking at everything with new eyes. Fill up your peace and joy tanks today. Thanks for visiting! Toodles for now. Love the color!!! Great title That song is now stuck in my head. 😜Beautiful job Laura!! Really love this one!! Oh thank you, I’m so glad someone loves it lol! It was quite a challenge drawing a clover flower and I’m really trying to get better at florals. ❤ Thanks for brightening my morning once again, ma'am! Are you kidding. Someone? One of my faves! 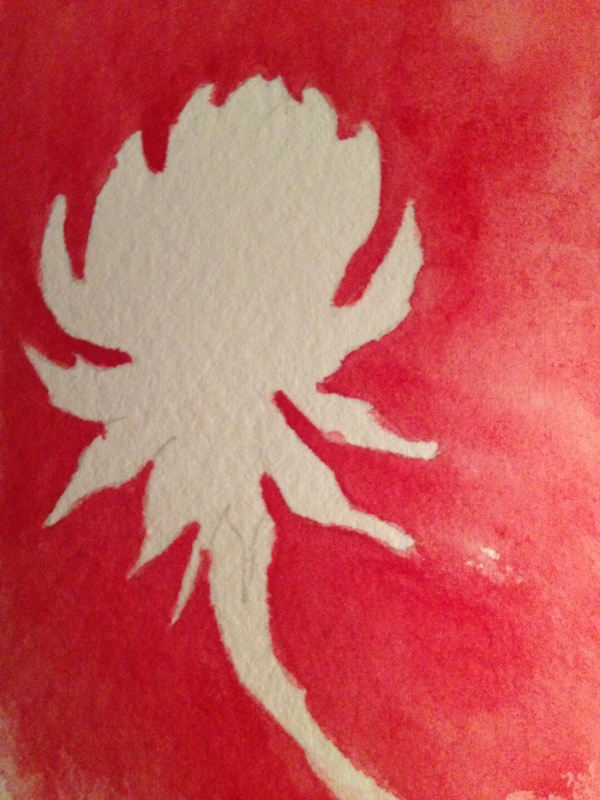 Do you use masking fluid to mask off the flower or just draw it and keep the watercolor away from it? I’ve never used masking fluid. It smells lol. I just paint carefully around the flower with clear water and then when you drop the paint in, it’s confined there but I did go over the lines here and there which is why it bled out a bit. Cool i haven’t either but have thought about trying. And you should do it! But with a crappy brush you don’t care about. My body is still in detox mode and so I try to stay away from chemicals and that at this point, still. lol. Talk to text while walking to mailbox. Silhouette. Lol I figured it was something like that but couldn’t decipher! I like silhouettes too. I’ve been thinking about them more since doing the cat crossing painting. It is absolutely gorgeous here, thanks! Glad you are enjoying a beautiful day, too. This is so beautiful, Laura!!! Looks like you really love and enjoy watercolor! Happy Sunday to you too! Love the color! Thank you, Jill! I’m glad you enjoyed it!